Seagate recently released this very compact and great looking breed of external hard drive that works wirelessly with Android and Apple Tablets. Sold for around $199, it operates on a built-in wifi network that broadcasts and streams its stored data to up to 3 wireless devices simultaneously. After loading it up with your pictures, videos, and documents from your PC or laptop, they can easily be accessed from your Tablet by connecting to the GoFlex’s broadcasted, wireless network and copying your files to your Tablet’s memory. 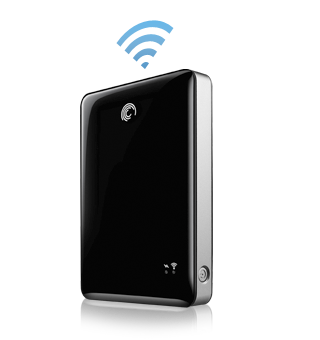 The GoFlex is powered by its built-in, rechargeable battery with a 5 hour lifespan which adds even more portability. One of the drawbacks to owning a Tablet is that you’re stuck with the amount of storage it offers, without the ability to increase its capacity. 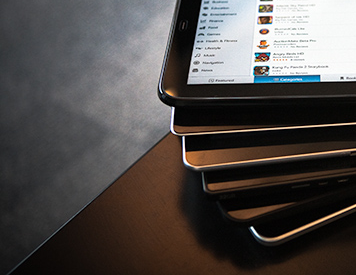 Having the GoFlex’s 500GB of external and easily accessible data can launch your Tablet from being used for entertainment, to being used for productivity. No matter how much we all love touchscreens, the virtual keyboards within are still considered to be a compromise when it comes to typing long emails or working with documents. Having an external, more traditional keyboard can greatly increase the ease of typing and provides the added bonus of key stroke shortcuts into the mix. You may have seen docking station style keyboards for iPads and other Tablets before, but this one offers a bit more. The Logitech Keyboard Case is an external dock keyboard and hard carrying case in one. 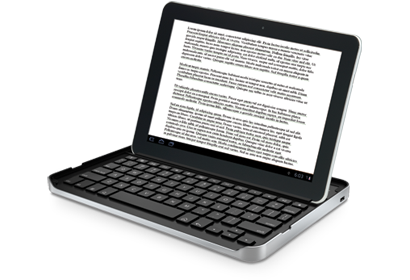 It hold your Tablet face down to provide portability and protection from wear and tear, then releases to open to a recess just behind the full qwerty keyboard that holds your Tablet at an ideal angle for typing. The keyboard pairs up with your Tablet’s Bluetooth and charges it’s battery over USB. Shortcut keys provide quick access to common commands like cut, paste, and return to home screen. After using your Tablet for a while, the fingerprints and smudge marks left on the screen can, not only provide insight into how dirty your hands are, but also cause touch screen instability in unwanted screen selections. 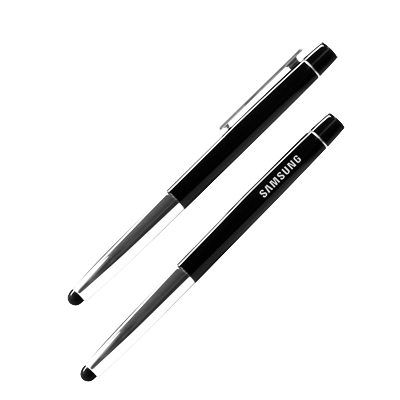 The Galaxy Tab Conductive Stylus simulates a finger touch, tap or swipe to provide a full touch screen environment without leaving a single fingerprint behind. Also, a stylus can come in real handy when browsing websites that contain tiny link buttons and when extremely precise screen tapps are required for drawing applications and gameplay. You can now print directly from your tablet, sending documents and photos over the internet for queuing directly to any printer that you specify with the PrinterShare App. Before you can use the service, you’ll first have to install the desktop version, create a PrinterShare account and define the printers you want to associate with your account. It can work across multiple PCs and locations, provided you install the desktop on a local client and use the same credentials. Once that’s done, you can simply launch the app on your tablet, log in and begin sending print jobs over the air. You can also search for nearby Wifi and Bluetooth printers or Remote printers shared with their software’s database. You can even share your own printer and have other users from print to it from anywhere. Having this app on your Tablet now makes it as productive as a fully functioning laptop. SugarSync is an online storage service that provides incredible functionality and user-friendliness to create a cloud-based storage service for both home and business users. This app provides the ability to store, share, back up and synchronize your files from any device online. Files are synced and backed up to your SugarSync account the moment you upload them and can be accessed from any mobile device, such as your Tablet or Smartphone. There’s no need to email yourself important files or copy them to thumb drives. 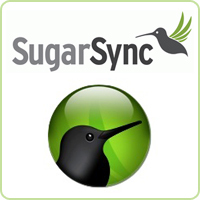 SugarSync can automatically sync files and folders across multiple computers. It work quite simply: If you have SugarSync installed on a home or office PC, you can set it to automatically sync data from certain folders (i.e My Pictures, My Documents, My Music, et.). 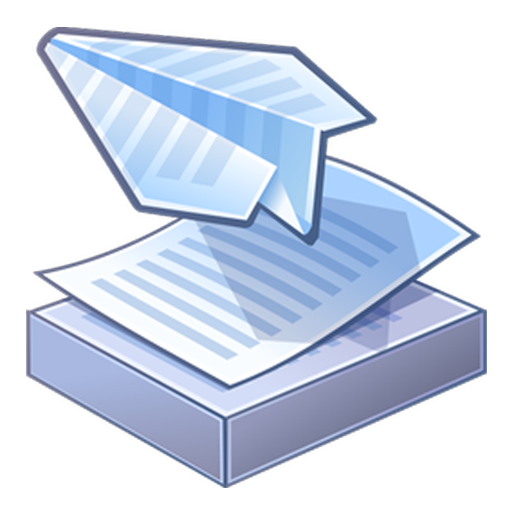 Every time you save a file into one of those folders, they can be accessed from a mobile device or any other device that has Sugarsynce installed. Fire up your desktop, laptop or Tablet and your most recent files will be waiting for you. The ability to remotely control your home or office PC is one of the biggest advantages to operating mobile devices like Tablets and Smartphones. More and more remote desktop apps are appearing on the Android and Apple markets, so a question you always have to ask is, “which one is the best?” The Android market offers a number of remote support apps that can range in price from 30$ to FREE, therefore, some may work better for you than others. We found an excellent free app called RemoteRDP. This RDP client supports full PC keyboard and mouse functionality and displays full 16:9 screen resolutions with easy scrolling and zooiming. It also supports multiple RDP sessions for easily accessing and controlling more than one PC at a time. With this particular app, you can take advantage of the same features that paid versions of other remote desktop apps offer.